On July 29, at Chungcheong Display Forum held in Hoseo University in South Korea, an encapsulation technology that can greatly increase OLED lifetime was revealed. Encapsulation technology prevents permeation of oxygen and moisture from affecting OLED panel’s performance and increases lifetime. As it is also the last process that decides OLED panel yield, OLED panel manufacturing companies are focused on finding the most optimal encapsulation technology. The flexible OLED panel that is currently being mass produced uses hybrid structure of encapsulation where gas barrier cover plate is applied to the organic and inorganic stacks of passivation. During this process, because cover plate with gas barrier characteristics is the key factor in deciding encapsulation performance the materials and technology are very important. The level of encapsulation that OLED panel requires is approximately 10-6g/m2day. The unit signifies the amount of permeation for 1m2 area a day. This amount is same as 1 drop of water in an area size of 6 World Cup stadiums. Generally sputtering technology is used to form gas barrier layer. Sputtering technology is an evaporation technique where ions of the target material is coated to the substrate as noble gas, ionized via high voltage, collides against coating material. This type of sputtering technology creates particles and defects during process. As such, in order to be applied to OLED, multilayer is required leading to a decrease in productivity and increase in production cost. However, at the Chungcheong Display Forum, Professor MunPyo Hong of Korea University, revealed that defect that occurs during the existing sputtering process can be reduced by stabilizing target layer through installing reflector which induces neutral beam to be released. According to Hong, this technology is sufficient to achieve the OLED level encapsulation standard of 10-6g/m2day even using a single layer. He revealed that this technology will be able to reduce the production cost and increase the productivity. The current TV market trends are curved design, large area, and high resolution. LCD and OLED, competing to lead the next generation display market, have both released curved large size premium TV of 55 inch screen or larger. In terms of resolution, UHD grade products are being released following FHD, and displays with higher resolution are being required. Looking at Korea and Japan’s contents roadmap, UHD resolution OLED TV development is essential as Japan is aiming to test 8K contents broadcasting in 2016, and Korea in 2018. Korea began test broadcasting UHD from 2013, and is aiming for regular application in 2016 for satellite/cable channels and 2018 for broadcast channels. Considering active release of UHD TV occurred in 2014, 8K TV’s market release is estimated to be in 2019-2020. It is analyzed that approximately 3 years are left to prepare for 8K TV mass production. At present 8K LCD TV have been revealed by key panel companies through various exhibitions, and its mass production is set for 2016-2017. However, only up to 4K OLED TV have been unveiled, falling behind LCD in terms of resolution. The keys to 8K OLED TV actualization are pixel size reduction and aperture ratio achievement. LCD uses 1 transistor and capacitor per pixel whereas OLED requires 2 or more transistors and 1 capacitor per pixel. This leads to OLED’s difficulty in acquiring adequate aperture ratio and reducing pixel size compared to LCD. 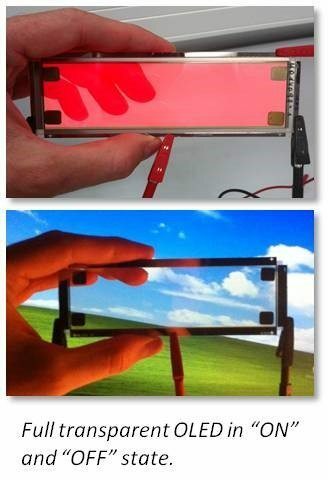 The key solutions are developments of top emission structure of OLED panel for TV, instead of bottom emission that produces light through TFT, and emitting materials that can generate sufficient light efficacy from bottom emission produced aperture ratio. OLED demonstrated its strength as display by achieving what LCD took more than 10 years in 2-3 years. Considering this, although approximately only 3 years are left to mass produce 8K display, it is anticipated that OLED is capable of catching up to LCD’s resolution. http://jpn.olednet.com/wp-content/uploads/2015/07/ㅋㅌ.png 817 1825 OLEDNET http://jpn.olednet.com/wp-content/uploads/2015/09/logo_oled.png OLEDNET2015-07-23 11:43:352015-07-23 11:43:35OLED 8K TV, When Would It Be Possible? Professor Taek Seung Lee and Jongho Kim (Chungnam National University’s Department of Advanced Organic Materials and Textile System Engineering), and Professor Jin Sung-Ho and Park Juhyeon (Pusan National University’s Graduate Department of Chemical Materials, and Institute for Plastic Information and Energy Materials) authored a paper titled ‘Synthesis of conjugated, hyperbranched copolymers for tunable multicolor emissions in light-emitting diodes’. For 2015 June issue, Polymer Chemistry, published by the Royal Society of Chemistry, selected it as its back cover. The paper discusses research of polymer material applied to solution process and explains that through polymer structure in the form of hyperbranched red, green, and blue monomers, diverse colors, including white, can be actualized depending on the amount of each monomer. Existing OLED lighting used R/G/B or YG/B stacking structure to produce white OLED, complicating the process. Although a method of producing white by combining R/G/B together is being developed, energy displacement between R/G/B can cause unwanted colors. However, if the R/G/B monomers can be introduced to polymer structure as hyperbranched forms as the paper suggests, the energy displacement can be minimized when the polymer solidifies which makes it easier for the colors to be realized. Professor Lee revealed that hyperbranched polymer materials were used in the research and that as white can be produced from just one polymer material, simple process can be used for the production. The patent for this technology has been applied (application number 10-2012-0091350) in Korea. 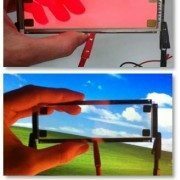 It is anticipated that this will become a key technology for reducing the next generation OLED lighting production cost. South Korean research team lead by Professor Changhee Lee in Seoul University succeeded in making first quantum dots that emit ultraviolet light and used them to produce a flexible, light-emitting diode. UV light is usually produced by mercury lamps or LEDs made from inorganic materials such as gallium nitride (GaN). However, mercury lamps tend to emit a wide range of visible wavelengths as well as UV, and high-performance gallium nitride LEDs are expensive to make. According to Professor Lee, quantum dots are an attractive alternative which can be made using potentially less expensive solution-based processes. Quantum dots, made out of a semiconductor material, emits different wavelengths depending on the size and shapes. The smaller the crystal, the shorter the wavelength of the light it emits. The Professor Lee’s team is the first in succeeding in making quantum dots that emit wavelengths shorter than about 400 nm, the high end of the UV spectrum. In order to produce UV nanocrystals, the team had to figure out how to make quantum dots with light-emitting cores smaller than 3 nm in diameter. To make these, the team utilized cadmium zinc sulfide, which emits high-frequency light, zinc sulfide shell. The quantum dots produced through this method emit true UV radiation at about 377 nm. Professor Lee explained that they “can go to much shorter wavelengths than people generally expected from quantum dots”. The research group then made a flexible LED with the quantum dots, using a design for a high-efficiency device they developed in 2012. Professor Lee’s team showed that the UV LED could illuminate an anticounterfeiting mark in a bill of paper currency. Franky So, a materials scientist at the University of Florida, says making a device out of the quantum dots that shines brightly enough to reveal the currency mark is a remarkable accomplishment. If their lifetimes can be improved, these potentially low-cost UV LEDs could find uses in counterfeit currency detection, water sterilization, and industrial applications. The research team headed by Professor Lee includes Seoul National University, Professor Seonghoon Lee and Professor Koonheon Char, and Dong-a University’s Professor Jeonghun Kwak. The research was published in Nano Letters (Nano Lett. 2015, DOI: 10.1021/acs.nanolett.5b00392), a monthly peer-reviewed scientific journal, and reported on Chemistry & Engineering (27 May), published by the American Chemical Society. The Dutch deposition equipment specialized company SolMateS unveiled the new OLED deposition process. 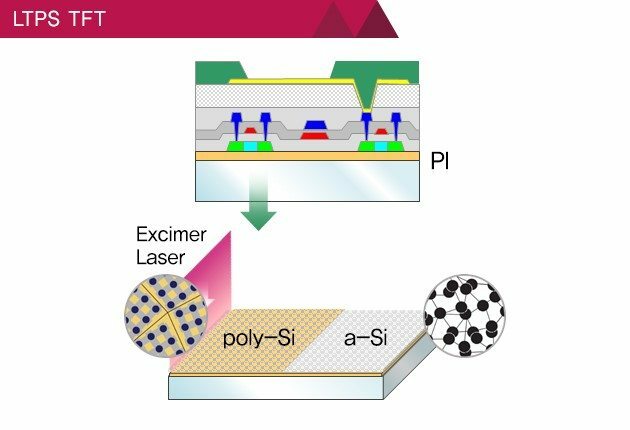 The newly developed deposition process by the SolMateS is a full transparent OLED called ‘soft-landing’ based on SolMateS’ pulsed laser deposition (PLD), which already obtained the patent. According to the SolMateS, the existing deposition technology like sputtering may cause damage to organic layers whereas the ‘soft-landing’ method enables to put an ITO thin layer on top of the OLED without damaging as it is proceeded in an even process temperature. And recent test result shows not much difference in their functions between the OLED of 80% transparency and aluminum electrode OLED of no transparency. The ITO was deposited in the speed of sputter and PLD tool of 200mm is possible. Established in 2006 in the Netherlands, the SolMateS is the deposition equipment supplier based on the laser deposition. LG Display (LGD) is promoting actively as unveiling the plastic OLED technology applied to its own G Watch R.
It is published under the title ‘The New Advancement in Display technology: LG Display’s Plastic OLED’ on the LGD’s U.S Newsroom (http://lgdnewsroom.com/) and the contents are as follows. Plastic OLED is an OLED that is made out of plastic substrate. There are 4 very special key technologies applied to this OLED. 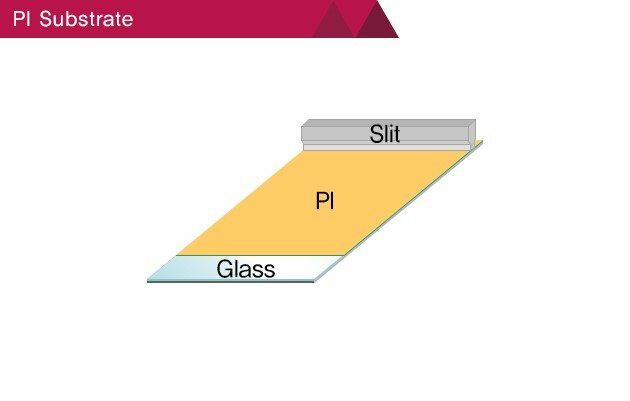 LG Display has shattered the common belief that plastic cannot stand high temperatures, and developed plastic substrate (PI or polyimide) that remains stable under high temperatures and has chemical stability. Moreover, due to the development of the coating process of large format PI, it has become possible to manufacture PI film, which has enabled the plastic curving technology and the technology to eliminate unnecessary bubbles and foreign substances. One of POLED’s important features is that it can have thin bezel, since the fast electron mobility technology made the integration of different parts to be possible. With the technology to manufacture inorganic film that prevents water and organic film that prevents alien substances, plastic OLED guarantees the stability of OLED elements. The display surface is relatively clean and neat, as it prevents foreign substance from permeating the surface, by using Laser Source Uniformity technology, alien substance/crack prevention process technology, and flat-panel Back Plate Film and Film Lamination technology. 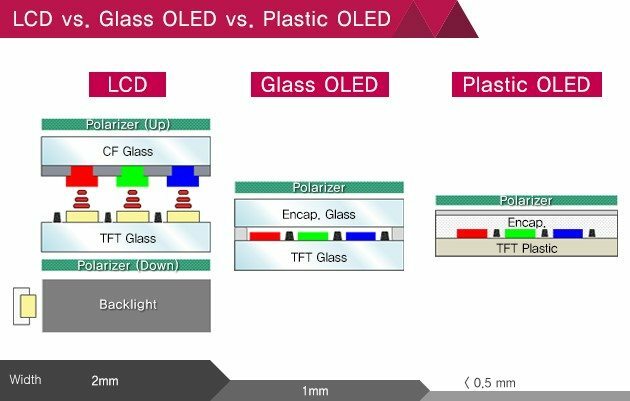 1)Compared to currently existing displays, Plastic OLED has simpler structure. 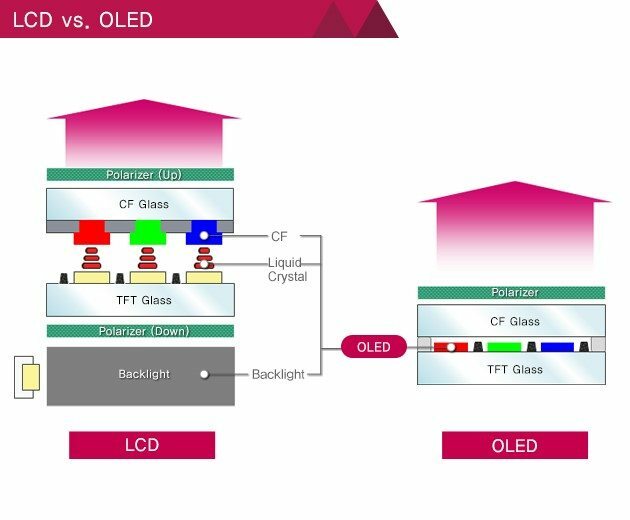 As it can be seen from the diagram below, LCD is composed of many layers of boards, while OLED’s structure is very simple. 2)While glass displays are prone to breakage, Plastic OLED, which is film based, is flexible to be curved to a certain angle, and it does not break easily. 3)Compared to LCD and glass OLED displays, Plastic OLED is thinner and lighter. As Plastic OLED can be applied to curved displays that are bent to a certain curvature, it can be used in various ways, including electronic goods, such as mobile phones, monitors, and TV, as well as cars, wearable devices, and items for interior design. Other than its design, Plastic OLED is valuable in terms of portability and durability as well. Hence, it seems that Plastic OLED will play an important role in people’s everyday lives in the future. The Plastic OLED’s potential is very promising. 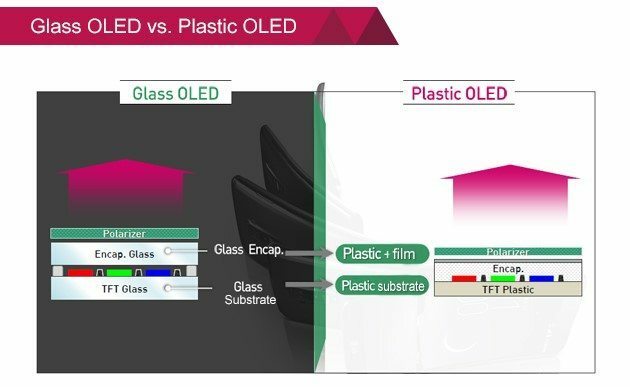 LG Display is devoting its energy and resources to respond quickly to fast growing market and consumers’ needs in order to develop Plastic OLED to become the key OLED application technology in the future. 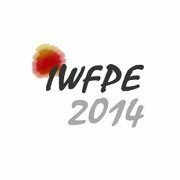 At the International Workshop on Flexible & Printable Electronics, IWFPE held in Jeonju, Konica-Minolta and DuPont presented diverse technologies that converts the OLED production process which requires a glass substrate into the technology of using a flexible substrate and printing technology. Konica-Minolta is under development of the OLED panel for lighting and the production of a flexible OLED panel as a printing technology of R2R method for the first time in the world is imminent. Based on the camera film production technology, Konica-Minolta has a wide range of light-emitting materials technology and also the R2R technology at the same time, getting attention as a front-runner to open a new era of flexible electronics. DuPont is the pioneer of the solution processed OLED display business as well. Equipped with the nozzle printing method which is its own printing technology, it continued to research and develop for many years with Samsung Display. The most critical benefit of the solution OLED is that it is the only technology to manufacture a large area OLED panel over 55-inch with RGB method at a large equipment bigger than the Gen8. DuPont completed the technological development of containment creation, ink deposition, and ink drying which are the essential technologies for the production of the solution OLED panel and is accelerating the commercialization. DuPont prospects that the solution OLED panel market will be open within three years at the latest. Korean researchers have developed the highly efficient florescent organic light-emitting device which enables to enhance the efficiency more than three times and is receiving much attention as the next generation display. Using the solution processing, it is expected to ease and simplify the process of producing the organic light-emitting device as the large area compared to the existing vacuum deposition plating. However the problem is that when a device is produced through the solution processing using the existing fluorescent emitting material, the efficiency (external quantum efficiency) is only 5%. This is much less than the 20% which is the efficiency when produced by the vacuum deposition plating process. The research team developed the high efficiency fluorescent organic light-emitting device, improved three times more than the previous fluorescent device for the solution processing. Compared to the existing structure, a solubility was increased by introducing the alkyl group as a substituent. Furthermore, the Donor-Acceptor Structure was employed to realize high efficiency by inducing delayed fluorescence phenomenon. It is anticipated to advance the commercialization of a large scale organic light-emitting device for the enlargement of a future display. The decrease of efficiency issue was resolved by making the surface film coating of a device smooth through the development of a new fluorescent light-emitting material which is soluble in organic solvents. And introducing the strong Donor – Acceptor structure, it was possible to improve the efficiency as drawing delayed fluorescence phenomenon. The Donor – Acceptor structure refers to a monomer composed of an entity that donates electrons to another compound and that accepts electrons transferred from another compound.